"How My Education is the Key to a Successful Future"
"If I Were Leader of the Free World, the First Issue I Would Address Would be ... "
Clubs are free to run a club-level competition to select winners to move on to the applicable Zone, Regional and District level competitions. Clubs can award monetary awards of up to $500 per winner for each competition. All materials for club competitions can be purchased from Corall Group by visiting www.optimistsales.com. 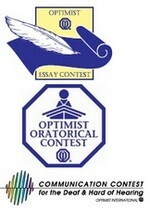 so the competitors have to send the essay to the alberta optimist club first?